Chinese topped the list of foreigners barred from the Philippines for being rude last year, followed by Americans and South Koreans. File photograph. 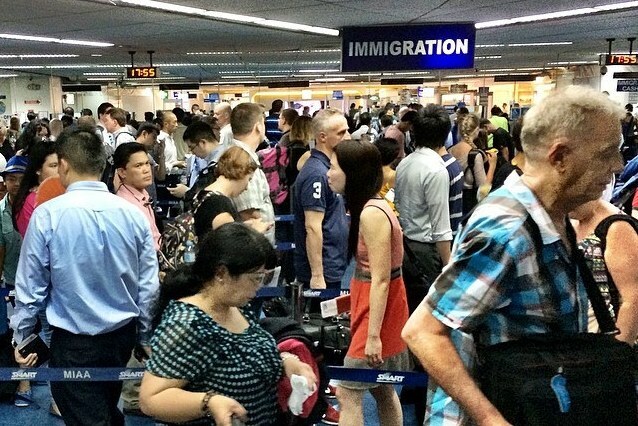 The Bureau of Immigration barred 133 foreigners from entering the Philippines last year for being “rude and disrespectful” to airport staff. In a report to Commissioner Jaime Morente, BI Port Operations Division Chief Grifton Medina said today (Monday, January 14) that the number was up from the 129 barred in 2017. Commissioner Medina warned arrivals to not be discourteous or use foul language when dealing with immigration officers. “The entry and stay of foreigners in the country is only a privilege, not a right,” he said, adding that “insulting BI officers is not allowed”. Topping the list of those turned back were Chinese, with 37; followed by Americans, 25; South Koreans, 23; Japanese, nine; and Saudi Arabians, four. “They were also placed in our immigration blacklist of undesirable aliens, thus they are banned from re-entering the country,” said Mr Medina. According to BI spokeswoman Dana Sandoval, the BI has been strictly implementing a policy to disallow the entry of foreigners who “exhibit arrogance or make offensive utterances” against immigration officers, as they are “symbols” of Philippine authority. “While we have been instructed to observe maximum tolerance, arrogant and discourteous foreigners are sent back and blacklisted. Symbols of the country, such as authorities, should be respected,” she said. Ms Sandoval issued a similar warning last week after Fil-Am Actor Tony Labrusca — who was travelling on a US passport — ranted at immigration officers after he was given a 30-day tourist visa rather than a one-year Balikbayan visa. As we previously reported, he was “furious” at the bureau for “giving him a hard time, despite him being a celebrity, with people wanting to take pictures with him”.